9490 Droid Escape is a Star Wars set released in 2012. It contains four minifigures, C-3PO, R2-D2, two Sandtroopers, an escape pod which comes apart into two pieces, and an Imperial speeder bike. The main feature of the set is the escape pod. A majority of the escape pod is encased by two large semi-conical grey bricks, which have stickers depicting technical features. At the thin end of the cone is a light grey plate, and attached to this is an octagonal ring with eight thrusters attached using plates with clips on their ends. Four 2x2 grey cones make up the centre-most thrusters, while four 1x1 grey cones make the outer ones. On the wide end of the main cone are round bricks of medium and dark grey, making this end of the escape pod cylindrical. Beyond these is a large dark grey dish and some additional details. One of the large semi-conical grey bricks can be lifted up, accessing a seating area for R2-D2 and C-3PO. The set also comes with a small speeder for one of the Sandtroopers. The base of the speeder is composed of a grey round plate topped with a black round plate. At the back, on top of these, are the speeder's grey thrusters, and at the front is a brown plate that the Sandtrooper sits on. The portion of the speeder in front of this is angled back. It features a black handlebar on one side, for the Sandtrooper to hold, and at the front are grey clips holding two black rods. At the end of these black rods are the speeder's brown fins. 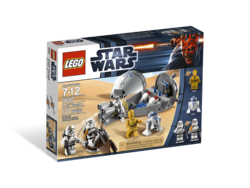 The minifigures included with the set are C-3PO, R2-D2, and two Sandtroopers. The Sandtroopers in this set have different coloured pauldrons; one has white (for sergeant) and one has orange (for squad leader). They also have printing on their helmets and torso depicting dirty armour, and the legs are also printed. The Sandtroopers have black heads with printed faces, much like Jango Fett. C-3PO also has a new design, with a new printed face and new torso printing, but is the same colour as in some previous sets. The set includes a grey 1x1 stud for one of the Sandtroopers to hold, representing a droid part that they find in the movie, making them aware of the droids' escape. When the Tantive IV comes under attack from an Imperial Star Destroyer, Princess Leia gives R2-D2 the secret plans for the Death Star before she is captured by the Imperials. R2-D2, as well as a reluctant C-3PO, escape in an escape pod, landing on Tatooine. There, they are abducted by Jawas and sold to Luke Skywalker and Owen Lars. Later, when the Imperials learn of the firing of this escape pod and also realize that their plans are missing, they send Sandtroopers to look for the plans on the planet's surface. One of the Sandtroopers finds a droid piece, indicating to them that it is droids that they are pursuing, and they follow them, eventually coming across the Sandcrawler that picked up the droids and the home of Luke's aunt and uncle. This set includes the some of the first Star Wars figures with printing on the minifigures' "feet" along with the Bomb Squad Trooper and ARC Trooper. The set is a re-design of 7106 Droid Escape released in 2001, 11 years before the release of 9490 Droid Escape. The set was redesigned again in 2016, but the Sandtroopers were replaced by Jawas. This is the first set that features C-3PO with a printed headpiece. There is a comic included in this set. In the instructions booklet version, it still uses an old design of R2-D2 and only Sandtroopers used orange pauldrons and blasters. In the set's online comic, R2-D2 has a redesigned head, while C-3PO's coloured armour is metallic gold and the Sandtroopers have a beacon to contact Darth Vader. This is a description taken from LEGO.com. Please do not modify it. 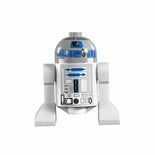 (visit this item's product page) Land the escape pod and hide from the Imperial sandtroopers! Facts about "9490 Droid Escape"
This page was last edited on 9 February 2019, at 23:56.